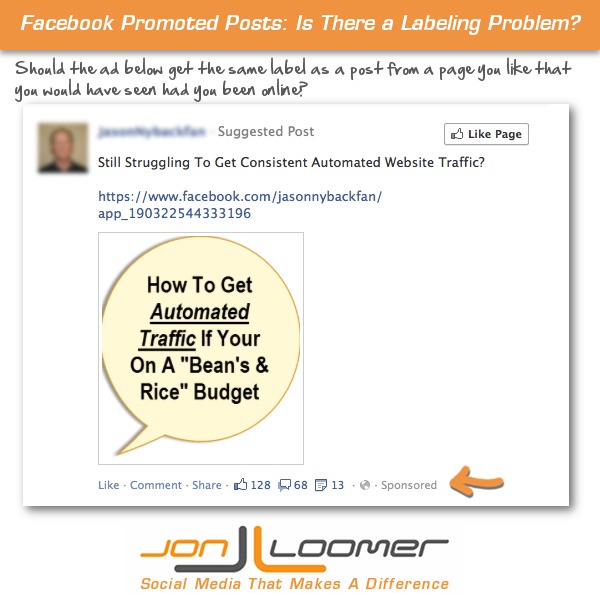 Facebook Promoted Posts: Is There a Labeling Problem? Maybe it’s semantics, but Facebook has a labeling problem. I’ve been struggling with something lately. I do not believe that Promoted Posts — paying to reach more of your Facebook fans (not referring to non-fans in this case) — should be considered advertising. Or at least the way that I use Promoted Posts (more on that later). Sure, there’s a line there somewhere. And maybe Facebook needs to create a completely separate product (more on that, too). But hear me out for a moment. The ad in the above screenshot gets a “Sponsored” label. Meanwhile, the content from the pages you’ve liked and actually want to see get the same treatment. Is this fair? I would suggest it’s not. Whether or not you see that label is often dependent on when you see my post (either before or after I decide to promote it). The content will be exactly the same in either case. It’s an unnecessary label that may negatively impact engagement. Unsolicited items show up in the sidebar with the label “Sponsored.” Crap like the image above show up in my News Feed. These are definitely ads. There is no dispute here. I don’t like to spam my Facebook fans. I just want to reach those who want to be reached. So when I promote a post, I show it only to fans and I do it at a level so that frequency remains as close as possible to 1.0. In my mind, the first two above are clear cut. The third — determining whether a fan would typically be reached — is a bit murkier, and the true dividing line between what I do and don’t consider advertising. Good email marketing software will allow you to segment subscribers based on time zones. This gives a marketer the power to deliver their email to users at different and more optimal times, depending on where they live. Such messages aren’t delivered with a “Sponsored” label on them (though, to be fair, no messages are). But more importantly, recipients do not care that these messages are segmented in this way. Isn’t promoting a post to fans that next step? When I promote a post, I’m not telling Facebook to show my content to someone who has given no indication they want to see it. I’m telling Facebook to show it in the News Feeds of people who have liked my Page when they are online, regardless of when I publish it. Is that advertising? Or is it a service? I know, it’s not cut and dry. While Facebook tells us very little about EdgeRank, we have been told that what shows up in News Feeds is dependent on affinity and time decay and activity and other things. So while the typical user doesn’t know the difference, such posts are still unnatural since they override this algorithm. And I also get that what seems like a “service” to me may still seem like “advertising” to the user. But it doesn’t feel like advertising to me since many of these people I paid to reach would have seen it anyway — and are perfectly happy seeing my content. As such, it doesn’t feel right that a “Sponsored” label appears next to it in the same way it does on some spammy piece of garbage that I don’t want to see. Since there’s a point where even a Promoted Post absolutely becomes advertising, I have a suggestion for a completely new product. When I promote a post, I’m not looking to reach a bunch of people against their will. I don’t want to reach people who don’t want to be reached. I want to overcome the biggest obstacle: Reaching those who want to be reached, but when they are actually online. Create a new service. Don’t call it an ad unit. Don’t label it anything. In fact, don’t even override EdgeRank (or only override the time decay element). Allow me to pay to reach the people who would have been reached had they been online when I posted it. Allow me to reach them once, and no more than once. That doesn’t mean that my post should reach every fan. You’d need to remove any fan who hid my page and never interacts with my content. And if said post gets no engagement, it should also suffer under the typical EdgeRank rules, reaching fewer people even when they are online. The typical open rate of my emails is somewhere in the neighborhood of 28%. So if my message goes out to 5,000 people, 1,400 will open it. No guarantees for clicks, of course. A big part of that is delivery. If delivered on a schedule consistent with time zones could increase that rate to 38% — or another 500 people — that would be extremely valuable. Maybe I reach 15% of my Facebook fans with a typical post. What if I paid Facebook to deliver that post to the people who would typically see it when they were online, thereby increasing that rate from 15% to 35%? That would be pretty cool, right? Should that piece of content — reaching those who want or would typically see it if online — see a “Sponsored” label? I think not. Maybe it needs a label, but it should be something much softer. What do you think? Is there a point where Promoted Posts are and aren’t ads? 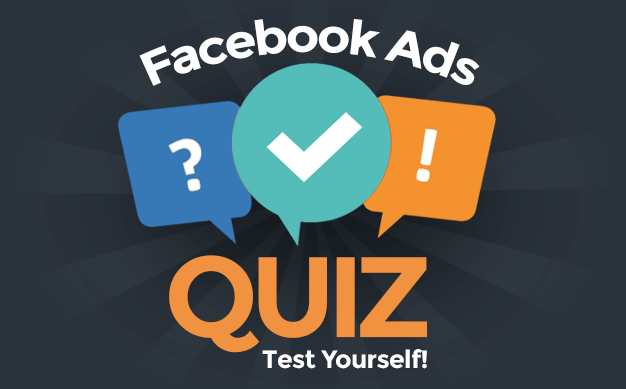 Should Facebook differentiate the two? And should Facebook provide a whole new service to fill this need?